For those who study humanity, it’s tough to get the big picture if they limit themselves to the culture, history and environment of just one place. That’s why the School of Human Evolution and Social Change at Arizona State University is taking students to four continents and two island nations this summer, where they will learn firsthand about topics like traditional health care practice, the latest in sustainable tourism, global haute cuisine, modern wildlife management and the dawn of humanity. The school’s Australia program is perfect for students craving adventure, says Assistant Professor Katie Hinde, the trip’s faculty leader. “It includes some incredible adventure activities — kayaking, hiking, snorkeling and canoeing — but no experience is necessary. Many students learn these skills on the program,” she said. Snorkeling at the Great Barrier Reef checks off a lot of students’ bucket lists, but this summer, Hinde is most excited for the sunset camel ride at the country’s most famous rock formation, Uluru. During the trip’s four weeks, students will live by the “One Health” concept that human, animal and ecosystem health are all interconnected and explore those connections through hands-on experiences across the country. The England program suits students from any discipline, as the undergrads from dozens of different majors who have attended in the past can attest. It touches on history, health, forensics and urban life, so there’s something of interest for everyone. That may be because program participants get privileged looks into many of the city’s otherwise-hidden places, like behind-the-scenes at the famed British Museum or inside the oldest hospital in Europe. “I was so close with all these remains from ancient Egypt, like a mummified crocodile — really cool stuff. And I was inches away from it, no barriers, no glass,” said undergraduate student Kaeli Stenroos of her British Museum experience last summer. A key focus of the trip is learning how scientists study human history, including major historical events like the Black Plague, through skeletal remains — a discipline known as bioarchaeology. Students also take walking tours of London with city guide Angie, who has been a group favorite for over a decade. Those who are curious about the relationship between food and identity, culture and health are ideal for the school’s program in France. There, students have the opportunity to explore topics such as the importance of food in French culture, how food has changed with processes like industrialization and immigration, and how people make decisions about what to eat. As the home of the people who pioneered the concept of cuisine, France is also the perfect place to learn how food has forged relationships and created identities throughout history. New Zealand provides a plethora of learning opportunities, said Research Professor David Feary, a native of the country and leader of this program. It has a socialized health care system, hosts a multicultural society (including the indigenous Maori people) and — as a smaller island nation — takes pains to incorporate sustainability into many aspects of life. The trip also includes tours to “Lord of the Rings” sites (because New Zealand) and breathtaking encounters with nature. “This year we’re going river rafting down through this forested area where it’s all about protection of native forests and the environment. Water is a big theme throughout the trip, so I’m looking forward to that,” Feary said. Students will also get the chance to collect data from interviews with locals for an ongoing climate survey, as well as learn about Maori culture and approaches to health. “This trip affirmed the things that I’ve been studying as an anthropologist. You learn a lot of theoretical frameworks for taking your mind out of your subjective biases, but actually being in another culture, seeing the different types of diversity, it was a different experience than I had ever had before,” said undergraduate Azzam Almouai, who joined last year’s excursion. Feary suggests that students pack light, as they often have to carry their luggage while traveling from Northland all the way down to Queenstown, hopping coaches and ferrying between islands. Students explore a variety of local ecological systems, like these mangroves, in Australia. Students visit a variety of important historical sites, including Stonehenge, in England. Students get plenty of hands-on opportunities to learn about food in France, such as taking a cooking class. Students tour Hobbiton as they take time to appreciate the unique cultures and landscapes of New Zealand. Students admire the wonders of Machu Picchu and the surrounding Andes Mountains in Peru. Students will see wildlife, like this lion photographed by President's Professor Kaye Reed, while exploring South Africa. For foodies who’d rather go south of the border than across the ocean, the Peru program uses food as a lens to understand humans and their relationships to each other and to the environment, while also exploring how those relationships shape our identities, daily practices and health. A major highlight of the trip is visiting the Misminay rural community outside of Cusco. Residents welcome students into their homes and give them hands-on lessons in their techniques for plowing the land and spinning and dying wool. “Anyone who is interested in the exploration of both nature and other cultures would have a great time on the South Africa trip,” said President’s Professor Kaye Reed, the program’s lead. There, students will learn about everything from animal identification and Khoisan culture to the apartheid system and hominin fossil discoveries. “My absolute favorite place to take students is Kruger National Park, where we will be identifying mammals of all kinds and working on the Hominins and Habitats Project from a safari vehicle,” Reed said. The trip also includes an outing at the seaside West Coast National Park, where students hike, kayak and learn about the local wildlife. However, Reed warns, they shouldn’t expect warm temperatures to match the setting. These are just a few of the many experiences offered through the ASU Study Abroad Office, which has 250-plus programs in more than 65 different countries. Each year at Arizona State University’s College of Liberal Arts and Sciences, alumni, community members and other supporters contribute to the future by investing in student success. And whether it’s extra money for class supplies, or providing the means to complete a career-shaping internship, the scholarships they fund have the power to transform lives. Growing up in the tiny Navajo County town of Holbrook in northeastern Arizona, she says campus offered what felt like endless potential to grow. That journey was possible thanks to the scholarships she received herself, particularly during graduate school. Now, through the Smith-Marshall Scholarship established with her husband, Jeff Marshall, in 2014, she’s helping other psychology students do the same. She is not alone. Home to 23 academic units, the college garners thousands of dollars in scholarships each year dedicated to supporting specific fields of study, bolstering first-generation students and financing study abroad and research opportunities. Launched in 2004, the Hearts and Scholars event gives philanthropists the chance to hear from recipients themselves about how they’ve been affected. Annmarie Barton, a dual major in biochemistry and anthropology who received the Deborah Oldfield Reich and John Reich Maroon and Gold Leaders Scholarship, says it’s an opportunity to catch her donors up on a year of changes. “I want to update them on how I’m doing, that I’ve added a major, and just let them know how appreciative I am that they decided to change their world which, in turn, changed mine,” she said. For as long as she can remember, Barton has wanted to be a teacher. Coming to ASU, and having the means to focus on studying, has helped that goal materialize. A meaningful experience in college isn’t just about attending classes, it’s also about leaving campus to pursue career-advancing opportunities elsewhere. That was the case for Nikki Hinshaw, a junior dual-majoring in political science and communication in the School of Politics and Global Studies and Hugh Downs School of Human Communication. 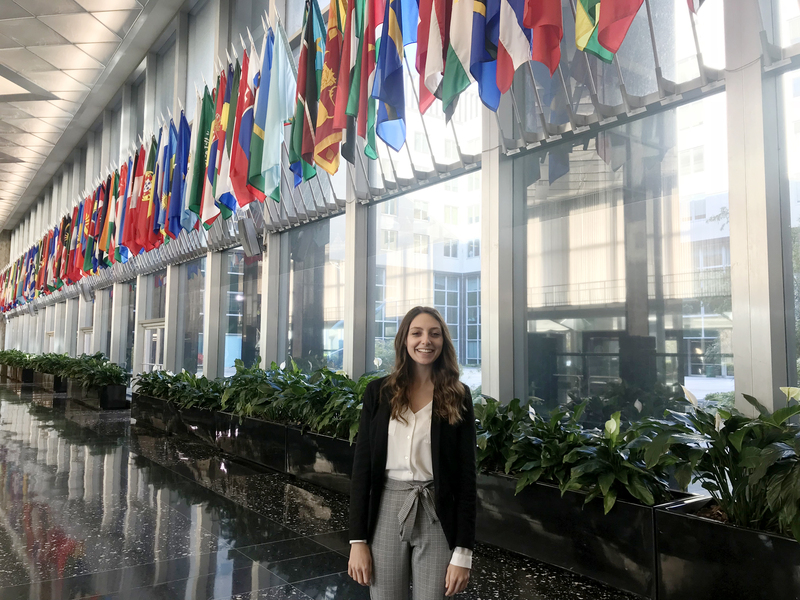 Receiving the Craig and Barbara Barrett Political Science Scholarship helped her study abroad and complete internships in Washington, D.C.
For many students, finances aren’t the only thing boosted by the funds. Benjamin Mesnik remembers being shy as an incoming freshman in the School of Life Sciences last fall. The support he received from the Dean’s Circle Scholarship made him feel more prepared. The annual Hearts and Scholars Scholarship Dinner will take place Feb. 5 on the Tempe campus for invited guests.